The slightly revised (and first American) edition of the 1979 Canadian collection of journalistic essays, reviews, columns, and character profiles from the esteemed novelist (The Lyre of Orpheus, 1988, etc.). 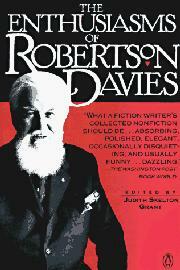 Readers of Davies' steady stream of novels may be surprised at the sheer volume of journalistic activity here, a large chunk of it predating his international reputation. Grant presents the ink-in-the-veins side of Davies, drawing on pieces the author wrote during his lengthy tenure as an Ontario newspaper editor, as well as his later work in journals as far flung as The Washington Post and TV Guide. Although arranged under three main sections--"Characters," "Books," "Robertson Davies"--the collection is overwhelmingly dominated by book reviews. Nevertheless, Davies is to an extent able to extend the normal life span of a review by extrapolating broadly--from reviews of Nabokov, Cary, Sitwell, and others--into tolerably enduring essays. Of particular note are his musings on a variety of forceful personalities, eccentrics, and cranks--"characters" is the polite designation here--that inspire some of the best writing in this collection. Extra points are in order for Davies' appreciation of Osbert Sitwell ("The aristocrat, in our century of the Common Man, is an underestimated creature. . .") and Dylan Thomas. Fans are likely to note a relationship between the author's connoisseurship of eccentricity here and the sorts of characters that tend to run amok in his novels. Appropriately enough, Davies' fascination for such personalities is capped off with a number of essays organized around his own behavior, and somehow he manages to carry it off: Davies on his own book-collecting vices and life as an editor, in the end, steals the show. A grab bag, but a good one, suitable for browsing while waiting for Davies' next novel.